A couple of months ago I received a message from a stranger called Luca Sellitto, introducing his band to me: “It’s in the Symphony X/Royal Hunt vein, with a personal touch”. Perhaps not so surprisingly, this raised an eye brow, but not really my expectations. After all, it is a tad ambitious to say this about yourself, especially if your name is not exactly known worldwide. Little did I know that Stamina is a genuinely brilliant band, and comparing themselves to big names is not a frivolity, but rather logical and truly deserved. Their latest album System of Power is a fine exemplar of excellent power/progressive metal, for a change originating from the Italian peninsula rather than the Scandinavian one. With 14 years of history under their belt, they are well known not only in their own country, but internationally, and especially honoured in Japan (the Mecca for European progressive metal bands). Last year (as well as in 2012) they supported Royal Hunt’s world tour, which in itself is a great recognition. 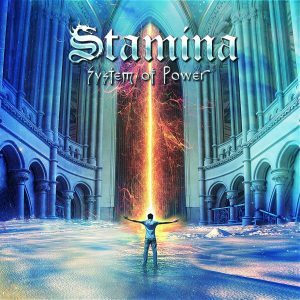 System of Power demonstrates just why, since their very beginning, the band’s aim has been to create a personal style of music, while combining a wide range of influences: anything from melodic power metal to progressive rock, to hard-rock and fusion. Their music does flow in your veins once you plug yourself into it, and you find it impossible to stop listening right from the word go: the great rhythm, brilliant melody and great vocal in the opening track catches you by the throat and makes you hold your breath for the next song. None of the tracks fails to deliver excellent quality. Instrumentally, the musicians rise to the challenge of competing in such a well populated genre. Exquisite guitar solos such as the ones in ‘One In A Million’, for instance, definitely point towards some great influences, but also make you want to compare them to the Masters. The shredding skills demonstrated in the album rise up to the level of talents such as Yngwie Malmsteen and Ritchie Blackmore. One may also find references to Savatage’s best years (‘Must Be Blind’); Stratovarius (‘Why’ – starting as a pretty direct reminiscence of their Tolkki era, then continuing as a typical Royal Hunt track, with all the orchestral layers and depth characteristic to them). My personal favourite is ‘One In A Million’ – a classical progressive metal track, opening with keyboard solo followed by power metal drum and base section, as well as a melodic guitar lead. Throughout the canvas of the album, lead singer Alessandro Granato shows off admirable vocal skills: another typical trait for the genre. Unsurprisingly, he is a well-trained classical tenor. His top notch technical skills can do justice to any Scandinavian progressive/power metal band and make Stamina particularly pleasurable to the ear. There is also the inevitable power ballad, ‘Undergo (Black Moon Part 2)’, a delightful angelic piece featuring romantic flute. Stamina also pay tribute to pop music with a wink in ‘Love Was Never Meant To Be’. Starting in pretty much a cabaret style, it goes on to evolve as a lovely melodic song, in Royal Hunt’s best traditions. The resemblance at times with the Danish band comes from the fact that some of Stamina’s ex members come from Royal Hunt as well as Andre Andersen’s own band. On the whole, ‘System Of Power’ would do proud any big band in the genre. It will definitely have a permanent space in my playlist, and I look forward to seeing them in the UK one day.